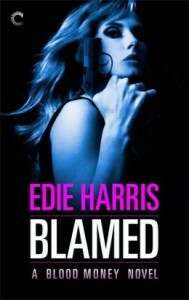 Edie Harris’s Blamed: A Blood Money Novel is an exciting must-read! This romantic suspense is full of spies, assassins…and revenge. Read on to get your sneak peek at this thrilling new book. BLAMED: A BLOOD MONEY NOVEL is available from Carina Press and online retailers! GET IT NOW FOR ONLY 99¢! Beth had almost had herself convinced, before this very moment, that the man on whom she trained her gun wasn’t a spy. She’d almost believed that those little zings down her spine whenever they’d nodded a greeting to one another had been basic attraction, not like recognizing like. Perhaps the quirked half-smiles when they ran into one another at the Starbucks two blocks over weren’t because Beth had caught him following her, but merely because they were in the same place at the same time, again. Maybe when he had come into the Institute gift shop to buy the print of the painting that even now hung haphazardly in his living room…maybe it had been pure coincidence, when he’d seen her walk past the shop on the way to her office and waved to her through the glass. And all the nights she had sat curled in the cozy armchair in front of her window, staring out across the street instead of focusing on curatorial paperwork, and seeing him quietly staring back at her? Maybe it had been a meet-cute waiting to happen, and her life was less Thriller Drama and more Romantic Comedy. Maybe her neighbor really was a normal, handsome, suit-wearing thirty-something: Preston Barnes, Commercial Real Estate Developer, just like the card she’d glimpsed when he’d dropped his wallet one Saturday morning at the nearby Whole Foods. Expression tight, he tilted his head slightly to the side, assessing her with that intelligent blue gaze, and she allowed herself a leisurely look at him for the first time since he’d moved in across the street six months ago, instead of quick, stolen glances. His pale eyes were thickly lashed beneath slashing black brows, the contrast of his neatly trimmed ebony hair against fair skin incredibly striking. He possessed an angular face, with the faintest of hollows beneath its contours, and the sharp lines of his jaw and chin and nose, not to mention the prominent cheekbones, gave him a harsh, masculine beauty. Without a doubt, he was one of the most gorgeous men Beth had ever seen, and the day’s worth of rakish dark stubble only made him more so. As though it were just that simple for him, Barnes spun the Ruger on one long finger and handed it to her, grip first. Seeing her no-doubt shocked expression, his smile changed again, back into the cute, lopsided Starbucks grin that never failed to set butterflies loose in her stomach. God, what was wrong with her, that this lying liar-face of a man’s smile got to her when Mark the Sous Chef’s didn’t? Why was it, she wondered, mind suddenly frantic, that she had been unable to shed her danger-junkie approach to men, as she had shed her old life? Beth wanted normal,damn it—not just a year of it, but a lifetime. The only conclusion left to draw was that she was too broken from all her bad deeds to understand normal. To deserve it. “No.” But he took her hand anyway. Boy howdy, was that a mistake. The second they touched, Beth’s skin sizzled, her breath catching in her throat as her gaze locked on his. She watched his pupils dilate and a hectic flush flag those too-pale cheeks, mesmerized by his visceral reaction to her touch. Tightening his hold on her, he levered himself up with a groan. “Looks worse than it is, I promise. Just do what you can.” Once standing, he released her, planting his hand on the counter when he swayed. « Scottish Heroes and Haggis—Yes, please! Love the excerpt of the book. Will buy it. Love the characters Beth and Barnes. They are great and hope they fall in love.